What is a Wide Temperature Computer? Wide Temperature is a term that’s been adopted by the IPC industry to indicate that a computer (or component) can operate in more extreme environments than your standard office building. 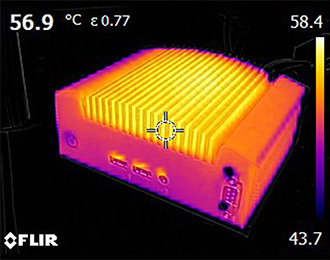 While different manufacturers have different standards for classifying something as “wide temperature”, Logic Supply’s wide temperature computers are capable of operating in environments as cold as -25°C and as hot as 70°C. When Should I Use a Wide Temperature Computer? We’ve noticed that many of our customers only inquire about Wide Temperature when they are placing a unit outdoors. While the system is more rugged than your average computer, we still recommend enclosing it within a NEMA enclosure to ensure that the outdoor elements do not inhibit system performance over time. If the computer is going to be used in an Industrial environment such as a manufacturing facility, a wide temperature system may be a sound investment. We would recommend using a wide temperature computer for steel production, meatpacking, food processing, manufacturing and any other extreme temperature environment. Not all wide temperature systems are created the equal. If your system will be subject to extreme temperatures, it’s important to ensure that your entire configuration has wide temperature components. We do offer non-wide temp rated components as an option to help make our ruggedized systems more affordable, but they may not be suitable for use in an extreme environment.